Habit: [Annual] perennial herb, subshrub; hairs 0 or simple, glaucous. Leaf: basal, proximal-most cauline petioled, simple to entire or 1(2)-pinnately lobed; middle, distal cauline petioled to sessile, base occasionally lobed or sagittate. Inflorescence: dense, elongated. Flower: sepals oblong to linear, spreading to reflexed, base not sac-like; petals yellow to white, long-clawed; filaments equal; anthers linear, coiled. 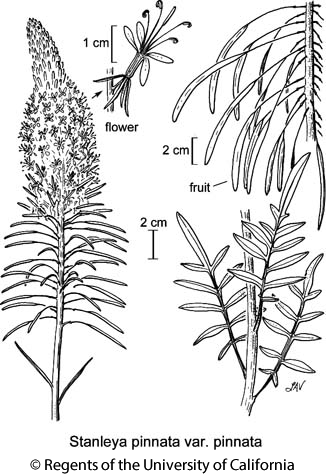 Fruit: silique, dehiscent, linear, flat parallel to septum or cylindric, unsegmented; stalk above receptacle [0.4]0.6--2.8 cm; style 0 or short, stigma entire. Seed: 10--70, in 1 row, oblong, wingless. Species In Genus: 7 species: western United States. Etymology: (E.S. Stanley, English ornithologist, 1775--1851) Toxicity: Concentrates selenium to TOXIC levels, rarely eaten. Habit: Perennial herb to subshrub. Stem: (1.2)3--12(15.3) dm, glaucous, hairs 0 or sparse; base branched, woody. Leaf: basal, proximal cauline 3--15 cm, 2--5 cm wide, oblanceolate to wide-lanceolate or ovate, pinnately lobed; distal cauline entire or few-lobed, base not lobed. Inflorescence: 1--3 dm, dense; buds +- yellow. Flower: sepals 8--16 mm; petals 8--20 mm, 2--3 mm wide, yellow, claw 4--10 mm, densely hairy inside; filament base hairy. Fruit: 3--9 cm, 1.5--3 mm; stalk above receptacle 7--28 mm; pedicel spreading, 3--11 mm, hairs 0 or few. Seed: (10)28--38, 2.5--4.5 mm, oblong. Chromosomes: 2n=28,56. Ecology: Chaparral, open sites, slopes, canyons, desert scrub, woodland, dunes; Elevation: < 2900 m. Bioregional Distribution: s SNF, SnJV, SCoR, SCo, WTR, SnGb, PR, GB, DMoj; Distribution Outside California: to Oregon, Montana, Kansas, New Mexico. Flowering Time: Apr--Sep Note: Stanleya pinnata var. inyoensis based on subshrubby pls, but these sporadic throughout range. Unabridged Note: Stanleya pinnata var. integrifolia (E. James) Rollins in Wyoming, Colorado, Nevada, Utah; Stanleya pinnata var. texana B.L. Turner in Texas have entire proximal leaves. Citation for this treatment: Ihsan A. Al-Shehbaz 2012, Stanleya pinnata var. pinnata, in Jepson Flora Project (eds.) Jepson eFlora, http://ucjeps.berkeley.edu/eflora/eflora_display.php?tid=66734, accessed on April 24, 2019.
s SNF, SnJV, SCoR, SCo, WTR, SnGb, PR, GB, DMoj; Markers link to CCH specimen records. Yellow markers indicate records that may provide evidence for eFlora range revision or may have georeferencing or identification issues. Purple markers indicate specimens collected from a garden, greenhouse, or other non-wild location.